Turmeric (Curcuma longa) yellow-colored root plant of the ginger family, Zingiberaceae. It is native to southeast India, where it thrives in places with significant amounts of rainfall. Turmeric has a peppery, warm and bitter flavor and a mild fragrance faintly suggestive of orange and ginger. Turmeric (Curcuma longa) yellow-colored root plant of the ginger family, Zingiberaceae. It is native to southeast India, where it thrives in places with significant amounts of rainfall. Turmeric has a peppery, warm and bitter flavor and a mild fragrance faintly suggestive of orange and ginger. When not used fresh, the roots are boiled, dried in hot ovens, then ground into a deep orange-yellow powder. 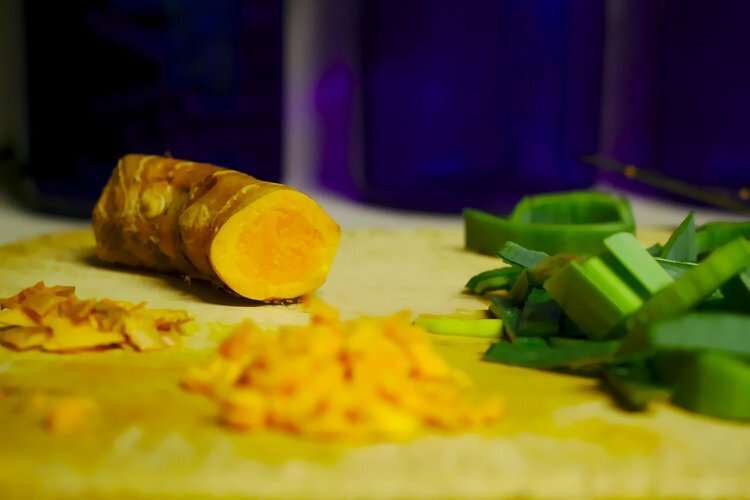 Here are 7 health benefits of turmeric. 1. Turmeric can assist in antioxidant defense. Turmeric possesses a good amount of manganese, which is an essential cofactor in some enzymes important in antioxidant defenses. 2. Turmeric can assist in red blood cell formation. Copper and iron are essential for the new blood cell formation. A deficiency of iron can lead to anemia, fatigue, and muscular weakness. 3. Turmeric can help improve cognitive functioning. The amount of iron in turmeric leads to increased hemoglobin production and increases blood flow. Proper amounts of oxygen and iron in the brain lead to improved cognitive performance and a decrease in cognitive disorders like Alzheimer’s disease and dementia. 4. Turmeric can help maintain a healthy blood pressure. 5. Turmeric can help fight various cancers. Studies have suggested that turmeric can stop the growth of existing prostate cancer and even destroy cancer cells. It also has preventive effects on tumor cells, such as T-cell leukemia, colon carcinomas, and breast carcinomas. 6. Turmeric can act as a natural liver detoxifier. Turmeric helps increase the production of some enzymes to detoxify the blood from harmful agents. 7. Turmeric can act as a pain reliever. Turmeric acts as a natural pain reliever due to its preventative spasm properties, which means that it can smoothen the kinks in the muscles as well as reduce digestive and menstrual cramping. Agarwal, R., Goel, S. K., & Behari, J. R. (2010). Detoxification and antioxidant effects of curcumin in rats experimentally exposed to mercury. Journal of Applied Toxicology, 30(5), 457-468. Piper, J. T., Singhal, S. S., Salameh, M. S., Torman, R. T., Awasthi, Y. C., & Awasthi, S. (1998). Mechanisms of anticarcinogenic properties of curcumin: the effect of curcumin on glutathione linked detoxification enzymes in rat liver. The international journal of biochemistry & cell biology, 30(4), 445-456.